Buy 1 for $19.32Buy 2 / Save $1.03!Buy 3 / Save $3.87! Size (inches): 2.13" X 2.13" X 3.58"
Cubeb Berry, also called Java Pepper, Tailed Pepper, and False Pepper, is a spicy berry native to Java and Borneo in Indonesia, which is now cultivated in several tropical areas, including southeast Africa. It is often used in cooking as a ready substitute for the more familiar pepper, Piper nigrum. Cubeb Berry can also be used for its fragrance in soaps and perfumes and can also be found as a flavoring in foods and tobacco. Cubeb Berry is considered a carminative, diuretic, expectorant, stimulant and antiseptic. 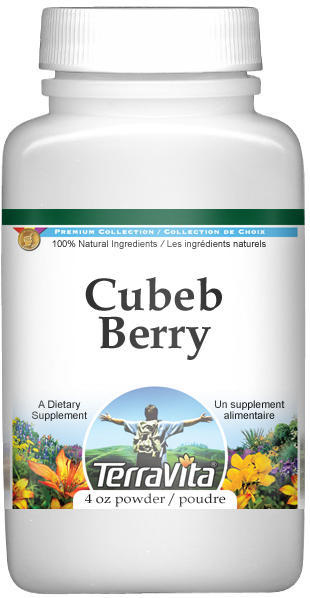 Cubeb Berry has been shown to be effective in helping ease the symptoms of chronic bronchitis. It can also be tried to help support digestive ailments and can be useful in helping support dysentery. Cubeb Berry also has a local stimulating effect on the mucous membranes of the urinary and respiratory tracts. The herb has often been associated with the reproductive system and can be used to help support cystitis, leucorrhea, urethritis, and prostate infections. Its action in regards to genital problems have led many to believe that Cubeb Berry has aphrodisiac properties and can be used in traditional love spells. Share your questions and information with the ZooScape community! Be the first to post! Stir 1/4 of a teaspoon into a glass of water and consume 3 times daily, with meals.